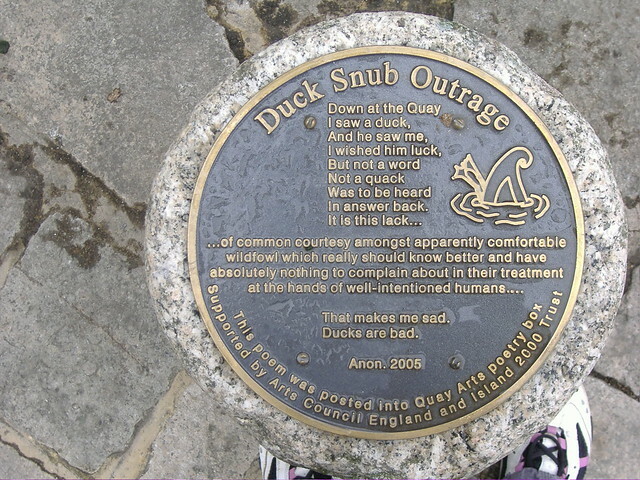 Duck Snub Outrage. Down at the quay, I saw a duck And he saw me, I wished him luck But not a word Not a quack Was to be heard In his answer back. It is this lack... of common courtesy amongst apparently comfortable wildfowl which really should know better and have absolutely nothing to complain about in their treatment at the hands of well-intentioned humans... That makes me sad. Ducks are bad. Anon. 2005 This poem was posted into Quay Arts poetry box . Supported by Arts Council, England and Island 2000 Trust.